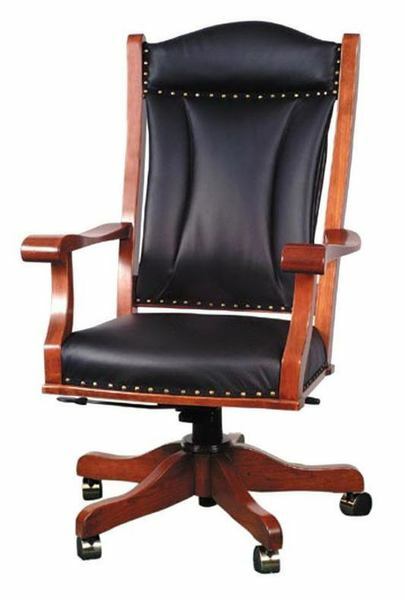 The Berlin Executive Desk Chair is the exact chair used by our CEO and owner here at DutchCrafters, so if you need a testimonial from someone who knows furniture, then his is the one to pay attention to. After testing many other desk chairs, the Berlin is the one he settled on and it is a decision that he hasn't regretted once. The cushioned back and seat with real leather upholstery not only creates an attractive and professional look, but it offers the best comfort and support out of any other desk chair on the market. Personalize the look of your Executive Desk Chair by selecting your wood and finish type for the chair frame and your upholstery type and pattern for the seat and back. The nail head trim offers a stunning accent as the finishing touch to an already gorgeous executive desk chair. Contact one of our friendly and knowledgeable furniture consultants for additional information or for ordering assistance with this amazing Berlin Executive Desk Chair. Seat Height: adjusts from 18"-22"